So many little hot spring resorts in Montana, surrounded by National Forest lands or perched in the middle of open valleys provide retreats unlike anywhere else. These places provide the opportunity for outdoor adventures followed by hearty food and blissing out in hot water. Montana also has a few undeveloped hot springs for those looking for a wilder experience. There is nothing quite like sitting in a hot spring in Montana in the middle of winter, with snow floating from the sky and your friends and family nearby. I encourage you to get out and try as many of Montana’s hot springs as you can. I am! Thanks to a hot spot below the earth’s surface, there are a bunch of Montana resorts and spas. This article covers the best hot springs in Montana, but also the worst—it covers them all. And really, there is no worst hot spring, because they are each funky and unique in their own way. Whether you are looking for hot springs in Montana with lodging and fine dining, hot springs with water slides and a family-friendly vibe, or a little hot pot off in the middle of nowhere, you can find it in Montana. There are even some private hot springs that take a little more effort (money) to get to. In my opinion, visiting a hot spring is one of the best things to do in Montana. Immediately below, you will find a list of hot spring locations and whether each is a hot spring resort or an undeveloped or “wild” hot spring. 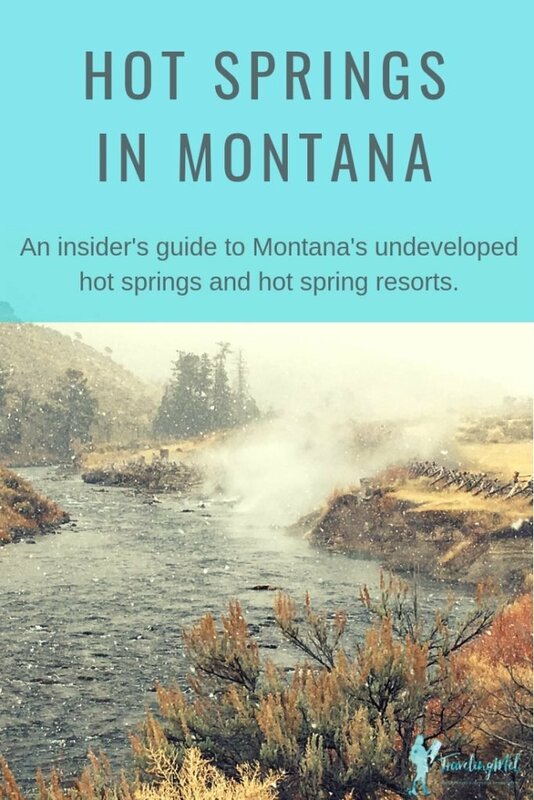 Click on the Montana hot spring you are most interested in or scroll past the list and read about each hot spring in more details and with specific directions to the Montana hot springs location. Click on the hot spring name to be taken directly to its details. A simple hot spring definition is “Hot spring, also called thermal spring, spring with water at temperatures substantially higher than the air temperature of the surrounding region.” They can also be called geothermal springs, meaning they are produced by the internal heat (thermal) of the earth (geo). In the case of natural hot springs in Montana, they are heated by magma beneath the earth’s crust and the earth’s crust is pretty thin here. A crack or fissure forms in the earth and water flows into it. Because heat rises, water is pushed up to the surface. If the fissure is narrow and there is a lot of pressure, the water erupts as a geyser (not good for soaking). If the fissure is big enough and there isn’t a lot of pressure, the water either flows out the spring or pools at the top, making a hot pot or hot spring. And Montana has some of the best hot springs in America. Yellowstone has the most famous hot springs in the U.S, but most of them are off limits to soaking. Fortunately, there is the Boiling River Hot Springs near Mammoth Hot Springs Wyoming, in the north part of the park. Additionally, Chico Hot Springs is just north in the Paradise Valley. Both hot springs offer different experience for Yellowstone area visitors and residents who want to soak in hot water. One of the most well known Montana hot springs resorts, Chico Hot Springs Resort is a turn-of-the-century, rustic, retreat snuggled into the Absaroka Mountains. Since we live about 30 minutes from Chico, we spend a lot of time there. It’s a nice mix of locals and visitors. We like it best after cross-country skiing in Mill Creek or hiking in the mountains nearby. There us usually a great band in the bar. Chico features an outdoor swimming pool and an attached, covered soaking pool. Chico Hot Springs resort is known for gourmet food—much of which is grown in the onsite hot springs gardens and year round greenhouse—great local bands, and luxurious spa services. If you are looking for a hot springs dining experience or one of the best Montana spa resorts, you can’t beat Chico. From Bozeman to Chico Hot Springs is about a one hour drive and incredibly scenic. Make your reservation for Chico Hot Springs Lodging on their website. You can find all the Chico Hot Springs rates there. Other Things to do Near Chico Hot Springs: horseback riding and dog sledding through the resort, Yellowstone National Park is about a half an hour drive away, plenty of hiking in the Absaroka Mountains, fly fishing and boating on the Yellowstone River. 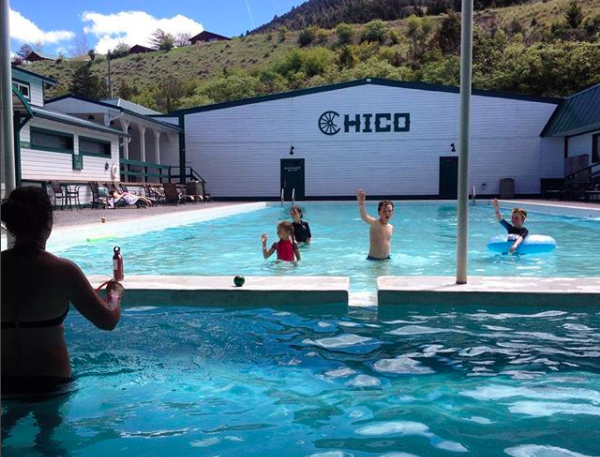 Read more about Chico Hot Springs in this post and get a 360-degree view on our YouTube channel. You park in Montana, but soon enter Wyoming on the half-mile trail. At the soaking area, a six-foot wide stream of hot water pours over a travertine ledge (like a mini hot springs mountain) into the Gardner River. Users have piled rocks to create a soaking area where the 140-degree water mixes with the cold river. Read more about these scenic hot springs on our other website: YellowstoneTrips.com. Hot Springs Hours: Daylight hours, closed in late spring and early summer when the river is high. Other Things to Do Near the Boiling River Hot Springs: All things Yellowstone. Yellowstone Hot Springs is about ten minutes north of Yellowstone National Park and is the newest developed hot spring in Montana. It sits above the Yellowstone River with terrific views of the mountains on both sides. There are 4,000 square feet of mineral hot springs divided into a big pool (102-degrees F) with two smaller pools inside it (one is a cold pool at 67-70-degrees F, the other is hotter than the main pool at 104-degrees F) and a kneipp walk. Kneipp baths are hydrotherapy tools popular in Germany and Austria. They are often found near trailheads and in wellness centers. You walk up to your knees in hot and cold water — usually on pebbles or while being massaged by jets of water. There is a small, clean changing room, showers, toilets, and sinks for men and women. They sell a few snacks, but you can picnic outside, near the pools with your own food. No alcohol. The hot springs are on the property of the Church Universal and Triumphant, which has its headquarters across the river, and they are open to the public. Other things to do Near Yellowstone Hot Springs: All the Yellowstone National Park things to do, horseback riding, hiking in the Absaroka Mountains, fly fishing and boating on the Yellowstone River. In Bozeman MT, hot springs are not far away. Because it’s not far from Yellowstone and the big plume of magma beneath its surface, there are several hot springs near Bozeman. Although, Chico is listed in the Yellowstone section, it is just a 50-minute scenic drive from Bozeman. There aren’t any hot springs in Bozeman, but Bozeman Hot Springs is 10-15 minutes away and Norris Hot Springs is about a 45-minute drive, so there are several natural hot springs near Bozeman MT. Bozeman Hot Springs is a fitness club with 12 pools (three outdoors) with temperatures ranging from 59 to 106 degrees. There are wet and dry saunas. Filled with Montana natural hot spring water, the indoor pools are drained and cleaned every night and because they are on a flow through system, no chemicals are needed. There is also a fitness center, with a separate fee, so you can work out before you soak. A summer campground and cabins are located at the facility. If you are looking for hot springs near West Yellowstone, this is your best bet. Other than the Firehole River Swimming Area in Yellowstone, which is warmish but not hot, Bozeman Hot Springs is the closest thing to West Yellowstone hot springs. Find the best deals on Bozeman Hot Springs Lodging here. If a hotel near Bozeman Hot Springs isn’t your thing, the Bozeman Hot Springs cabins and Bozeman Hot Springs campground are open in summer. Reserve your spot here. Bozeman Springs Prices (1/18): Senior ($7.50), Adult ($8.50), Kids 5-13 ($7.50), Kids 0-4 ($4.00), passes and memberships available. Other Things to Do Near Bozeman Hot Springs: Museums, hiking, restaurants, shopping in Bozeman. Downhill skiing at Bridger Bowl or Big Sky. Hiking in Gallatin Canyon. At Norris Hot Springs they say you can soak in the Water of the Gods, in fact, some people even call it Water of the Gods hot springs Montana. It is a pretty cool place. It’s funky, to be sure, but that’s what we like about it. The pool was built by miners and is basically a fir plank box without a lid. Norris used to be owned by a cranky, but entertaining, woman (Doris from Norris) who spray-painted rules on the walls. And she often misspelled them. The infamous “no lose dogs” sign is still there. Today Norris is known for great music in the dome and good food – much of it grown in the geothermally heated greenhouses on the property. And the pool is still great for soaking. 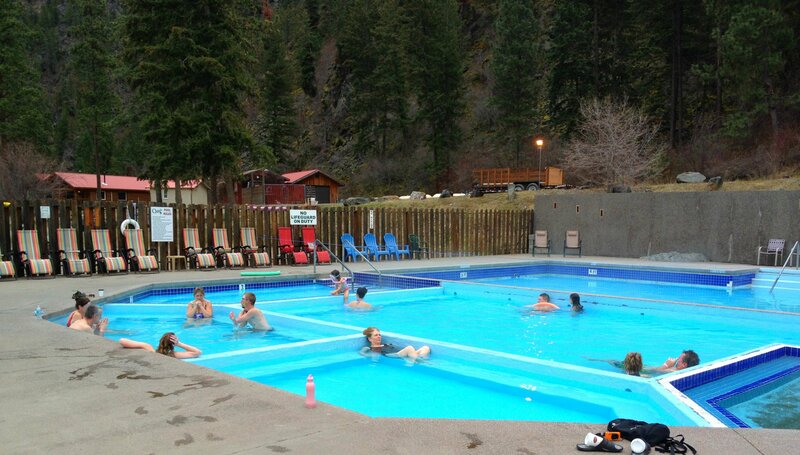 Find the best deals on Norris Hot Springs Lodging here. Make reservation at the Norris Hot Springs campground here. Norris Hot Springs Hours: (Sept – May) Thursday, Friday, Monday 4 pm- 10 pm, Saturday/Sunday 10 am -10 pm, (June-Aug) Wednesday – Monday 10 am -10 pm. Other Things to Do Near Norris Hot Springs: Fly fishing or floating the Madison River, hiking in Bear Trap Canyon, soaking in Potosi Hot Springs or Bozeman Hot Springs. Potosi Hot Spring Resort is not open to the public. However, there are four cabins you can rent via Airbnb that give you access to the indoor and outdoor pools. They are situated on the northeastern flank of the Tobacco Root Mountains and surrounded by National Forest. The Potosi Hot Springs cabins are adjacent to hiking trails and sleep six. Rent a cabin at Potosi Hot Springs Resort here. Use this code to get $40 off your first Airbnb rental. Other Things to Do Near Potosi Hot Springs: Fly fishing, hiking, soaking in Upper Potosi Hot Springs, drinking at the Pony Bar. Find the best deals on lodging near Upper Potosi Hot Springs here. Or stay at the Potosi Campground. Other Things to Do Near Upper Potosi Hot Springs: Camping, hiking, mountain biking, horseback riding, touring historic Pony, Montana. There are a handful of hot springs near Butte, Montana. Fairmont Hot Springs (Anaconda Hot Springs) is between Butte and Anaconda, Elkhorn Hot Springs is west of Dillon, Boulder Hot Springs is between Butte and Helena, and Potosi, Upper Potosi, and Renova hot springs are within a short drive. While locals are known to use this hot spring, it is officially closed and you will be trespassing if you don’t get permission from the landowners to visit. But, the history is interesting, so here it is. I like the Abraham Lincoln connection. “An abandoned hot springs with decaying resort buildings easily seen from a public road. A large quonset hut about 200 yards east of the road contains the swimming pool, which for a time was an open-air facility. A steady stream of hot water can be seen flowing from the pool building area, past the old guesthouse, under a footbridge, and then under the gravel road where you are standing. Find the best deals on lodging near Fairmont Hot Springs in Anaconda or Butte. Take I-90 east from Butte or west from Whitehall. Exit 241 and turn south onto Pipestone Road. Go 1.0 mile and turn left ontoHot Spring Rd/Pipestone Rd. Drive 240 feet and turn left onto Hot Springs Road. Pipestone Hot Springs Resort Ruins are on the left. Other things to do near Pipestone Hot Springs: Listen to the Ringing Rocks, cross-country ski or mountain bike at Homestake Lodge, swim in Delmoe Lake, tear it up on an ATV. With a large indoor swimming pool, a gigantic outdoor pool (with a 350 foot water slide) plus two soaking tubs, Fairmont Hot Springs Resort Montana is one of the largest hot springs in the region. Our kids love the water slide (it’s pretty fun for adults, too), and we love sitting in the pool with a drink. The indoor pools are great for people more comfortable in shallower water and lap swimmers. If you stay in the hotel you have unlimited access to the pools and slides. The Fairmont natural hot springs are something to return to again and again. In addition to water activities, Fairmont Hot Springs Resort Anaconda MT offers a golf course, tennis courts, children’s playground, wildlife zoo, lawn games, and a spa. There is a dining room, café, and a lounge/bar, so you never have to leave the facility. Don’t get this Montana hot spring resort confused with the resort of the same name in British Columbia, Canada. Watch the video of one of our visits to Fairmont Resort Montana for a first hand experience on the slide. Find the best deals on lodging near Fairmont Hot Springs in Anaconda or Butte. Or stay at the resort. The Fairmont RV Park has hooks ups and tent sites. Or stay at the Fairmont Hot Springs Montana cabins (Fairmont Chalets) within walking distance of the hot springs. We haven’t stayed at the Fairmont Hot Springs cabins, but they look nice. Other Things to Do Near Fairmont Hot Springs: cross-country ski at Mount Haggin Ski Area, hike in the Pintlers, explore uptown Butte, mountain bike, fish. It’s rustic, but lovely. Tucked into the Pioneer Mountains, Elkhorn Hot Springs Montana has several cabin rentals available, as well as lodge rooms. Breakfast at the lodge is included; dinner is available. There are two outdoor pools and one indoor sauna-pool. Most importantly, miles of cross-country ski trails leave from the cabin doors. And with hot springs near Dillon MT, you can stop at the Patagonia Outlet on your way to or from Elkhorn. Elkhorn Hot Springs for sale? Not any more. These hot springs have changed owners a couple times since we started visiting, but the new owners seem to really want to make a go of it. Stay at Elkhorn Hot Springs or find the best deals on lodging near Elkhorn. Elkhorn Hot Springs Hours: Sunday-Thursday 8 am–9 pm, Friday/Saturday 8 am-10 pm. Other Things to Do Near Elkhorn Hot Springs MT: Cross-country ski, hike, dig for crystals at Crystal Mountain, snowmobile, Bannack State Park, Maverick Mountain (alpine skiing). Read about one of our Elkhorn Hot Springs trips here. Jackson Hot Springs was purchased and reopened by the new owners. 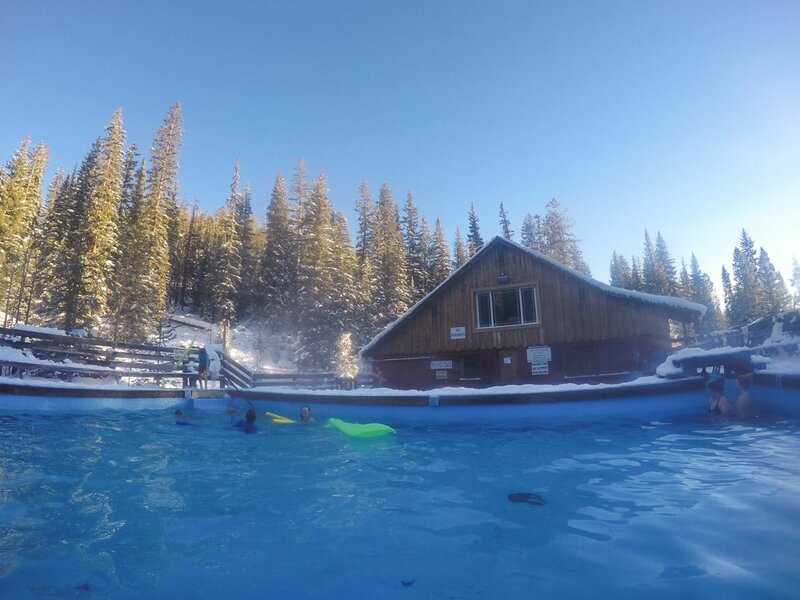 Situated near a ghost town and a battlefield, two downhill ski areas and a Nordic ski center, and several mountain ranges, Jackson Hot Springs Lodge is the perfect jumping off point for numerous recreational pursuits. The cavernous lodge hosts a restaurant, bar and dance floor, and leads to an outdoor hot spring-fed swimming pool. Stay at Jackson Hot Springs. Renova hot springs is really easy to get to as it is just off the road. That makes it less than ideal for soaking, but at least it’s a quiet road. Renova Hot Springs is basically a stone and concrete basin along a side channel of the Jefferson River. You can check the river level through the National Weather Service’s gauge at Silver Star at Parsons Bridge (but not during the winter months). About 700 cfs is a good level for soaking. Bring plastic party cups to plug the basin drains. Find the best deals on lodging near Renova Hot Springs here. Take Montana Highway 55 south from Whitehall about 12 miles to the Waterloo turn. Drive south a half mile and take the first right after crossing the Jefferson River. Follow the road for two miles, turning left onto Point of Rocks Road. Follow for about 3.6 miles to the springs, about 200 yards after the fishing access area. Other Things to Do Near Renova Hot Springs: Lewis and Clark Caverns, fishing, floating, rock climbing at Point of Rocks. Missoula Montana hot springs: From the Pioneer Mountains to the Bitterroot Mountains to the Garnet Ranger, there are several hot springs in western Montana. People are often looking for hot springs near Glacier National Park or hot springs near Whitefish, Montana, but you will have to go a little south and west to find the hot springs nestled in the Rocky Mountains. Same deal with hot springs near Kalispell. Lucky for Missoulians, there are a bunch of hot springs near Missoula, MT. Missoula hot springs include Quinn’s Hot Springs, Symes Hot Springs, Alameda’s Hot Springs Retreat, Rose’s Plunge, and Big Medicine Hot Sprigs to the north, and Lolo Hot Springs and Lost Trail Hot Springs to the south and Nimrod Hot Springs to the east. Some of the best Montana hot springs are near Missoula. 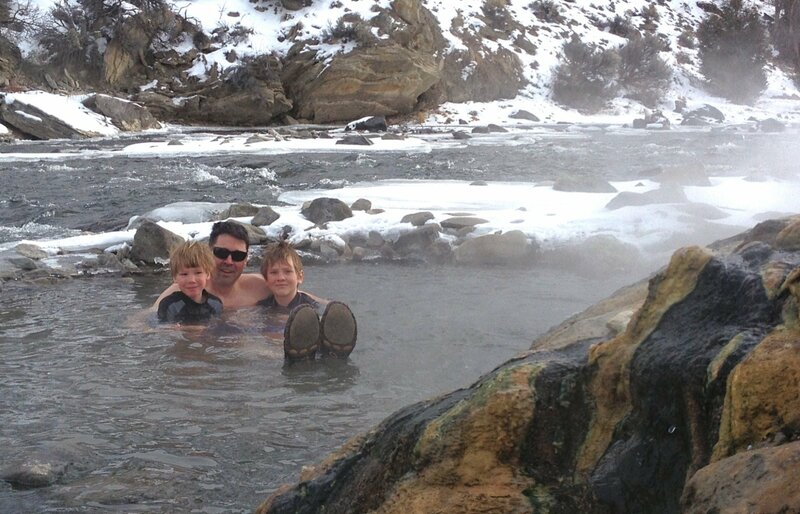 One of our favorite natural hot springs near Missoula is Quinn’s Hot Springs Montana. There are five hot pools, each a few degrees warmer than the one next to it, and one river-water-cold pool, which means a perfect soaking temperature for everyone. The soaking pools range in temperature from 60 to 106 degrees F. The two swimming pools are between 80 and 95 degrees. The staff said the Paradise Montana hot springs are monitored for cleanliness and temperature every three hours and emptied and cleaned every other day. Quinn’s Hot Springs also has a restaurant and bar, motel rooms, and cabins. Some lodging is for adults only. These northwest hot springs also qualify as hot springs near Spokane, Washington. Read my story about Quinn’s Hot Springs MT here. Stay in one of Quinn Hot Springs’ cabins or rooms. Quinn’s Hot Springs Hours: 9 am-9 pm in three hour sessions. Call ahead for availability. Other Things to Do Near Quinn’s Hot Springs: Hiking, fishing, soaking in the town of Hot Springs’ hot springs. Hot Springs, Montana is called that for a reason. It’s a tiny town, less than 600 people, on the Flathead Reservation named after its healing, mineral hot springs. There are several choices here of hot springs near Polson, MT. Because of its microclimate, Hot Springs is often drier and warmer than Kalispell or Missoula. From Missoula to Hot Springs MT is about an hour and a half drive. This is a great stop on your way to Glacier National Park. Aside from the hot springs, the town is know for its Hot Springs Artists Society, which brings musical groups to the Symes Hotel on Friday and Saturday evenings. It’s a great place to enjoy the tiny town hot springs and music. Find the best prices on nearby Hot Springs Montana hotels. Check the Hot Springs MT weather. Wild Horse Hot Springs is not technically in the town of Hot Springs, but rather in Glacier Country between Hot Springs and Quinn’s Hot Springs. It was closed (but still used by locals) for five years and reopened in May 2018. The facilities were (and still in the process of being) updated. The 10-acre resort sits on an low bluff overlooking farms fields. There are cabins and tipis along the bluff, which are available for rent. The hot springs site also has a tent campground and RV hookups. There are several 8X6 hot water plunges. The plunges are supplied by three large wells, including the “Mother Dragon Geyser,” that will eventually feed many more thermal attractions, according to The Missoulian. The springs were discovered in 1912 when a farmer drilled a well. The resulting gusher scoured a long ravine out of the bluff, which will be used for the group soaking area. Other Things To Do Near Wild Horse Hot Springs: Soak in other hot springs near Glacier National Park, fishing, hiking, horseback riding. An underrated hot spring Montana has to offer is the Symes Hot Springs Hotel & Mineral Baths. The mission-style hotel was built in 1930 and has updated rooms. There is also an RV park and tent camping is allowed. The Symes Hotel hot springs flow into three pools with temperatures around 107-degrees, 101-degrees, and 95-degrees. The Symes Bathhouse Grill and Cantina serves three meals daily and there is an espresso bar for caffeine and snacks. An onsite spa offers massage services. There is live music Friday and Saturday nights courtesy of the Hot Springs Artists Society and occasional special concerts on Sundays. In the summer the stage moves outside. Click here for Symes Hot Springs Lodging. Other Things to Do Near Symes Hot Springs: Soak in the other hot springs in Hot Springs, Montana, watch birds at Ninepipe National Wildlife Refuge, hiking, fishing. Another one of the hot springs in Hot Springs Montana is Big Medicine. Like all the medicinal waters in Hot Springs, Montana, these springs were first frequented by the Pend d’Orielle Indians who named them. There’s a great view from Big Medicine, a simple tub that’s emptied and refilled each day. Both Big Medicine and Rose’s Plunge are owned by Leroy and Rose O’Bennick. North Road approximately 1/2 mile east of Spring Street, 406.741.5140. Other Things to Do Near Big Medicine Hot Springs: Learn about homesteading and the Flathead Indian Reservation at the LaRue-Hot Springs Museum, get healthy and have your Tarot cards read at the Rainbow Zen Organic Juice Bar, Disc golf onsite, soak at the other hot springs in Hot Springs, MT. Like Big Medicine Hot Springs, Rose’s Plunge is owned Rose and Leroy O’Bennick and is a quieter, simpler alternative (with all the benefits of hot springs) to the more resort-oriented hot springs in Hot Springs. Rose’s Plunge is part of the Camas Recreation Center, which also hosts yoga classes and acupressure, reflexology, and energy balancing therapies. Find the best deals on lodging near Roses Plunge Hot Springs Mt here. Other Things to Do Near Norris Hot Springs: Check out the produce and local and fair trade goods at Towanda Gardens Nursery & Trading Post, soak at the other hot springs in Hot Springs, MT. Unlike the other Hot Springs MT hotels, Alameda’s Hot Springs Retreat (sometimes called Alameda Hot Springs) has private hot mineral baths in each suite – there isn’t a shared pool. The 1930s hotel grounds are home to apple and plum trees and an organic garden. Guests will find a 30-foot geodesic dome with wood-burning stove, a geothermal heated floor, and large bay windows. The dome is used for dance, yoga, music, and other gatherings. There is plenty of exploring and relaxing to do at Alamedas hot spring resort. Book a room at Alameda Hot Springs Montana through their website. Other Things to Do Near Alameda’s Hot Springs Retreat: Play at Flathead Lake, bird watch, soak at the other hot springs in Hot Springs, MT. Of Missoula, Montana hot springs, Lolo Hot Springs Lodge may be the most famous. Native people have been using the springs long before Lewis and Clark passed through in 1805. It’s the place where Paul McLean was killed in the book, “A River Runs Through It.” He really died in Chicago, but his brother changed the location for the book. You probably won’t be murdered in the lodge at Lolo natural hot springs; you will definitely have a great time. There are indoor and outdoor hot springs and pools (depending on the season), a bar, a restaurant, and a casino. The facility includes gaming machines, golf course, horseback riding, cross-country skiing, hunting and fishing, cabin rentals, RV site rentals, tents, and campgrounds. Find the best deals on The Lodge at Lolo Hot Springs and the Lolo Hot Springs cabins. Or look for other Lolo MT lodging. Lolo Hot Springs Hours: (Summer) Sunday-Thursday 10 am-10 pm, Friday-Saturday 10 am-midnight, (Winter) Sunday-Thursday 10 am-9 pm, Friday-Saturday 10 am-midnight. Other Things to Do Near Lolo Hot Springs Resort: Cross-country skiing and snowshoeing on Lolo Pass, snowmobiling, kayaking and rafting on the Lochsa River, horseback riding, hiking, mountain biking, golf. It’s just a short distance to undeveloped hot springs, Jerry Johnson Hot Springs and Weir Creek Hot Springs in Idaho. Lost Trail Hot Springs is nestled into the Bitterroot Mountains and as they say, “conveniently located in the middle of nowhere.” The outdoor pool is 92 F in winter and 96 F in summer. The indoor hot tub is a toasty 102 F in winter and 105 F in summer. There is also a dry sauna. There are ten cabins, including two Jacuzzi cabins, a motel, family reunion lodge, and RV park. The restaurant specializes in fresh dough, thin crust, NY Style Pizza and is open seasonally. Book lodging at Lost Trail here. Lost Trail Hot Springs Hours: (Summer) Monday, Wednesday, Thursday, Sunday 8 am-9 pm, Tuesday 8 am-3pm, Friday 8 am-10 pm, Saturday 8 am-10 pm. (Winter) Friday 12 pm–9 pm, Saturday 8 am-9 pm, Sunday 8 am–7:30 pm. Other Things to Do Near Lost Trail Hot Springs: Bird watching, hiking, biking, fishing, downhill skiing at Lost Trail Powder Mountain, cross-country skiing at Chief Joseph Pass. As the name implies, Nimrod Springs is warm – about 70 F—not hot. Nimrod is best visited in summer. This undeveloped hot spring pool is fairly large and deep. One cool features is an underwater cave that you access by swimming under the rock face and popping up a few feet away inside the cave. It’s dangerous and I don’t recommend it but people do it all the time. Sidenote: a nimrod is both a skillful hunter and an inept person. No wonder English is hard to learn. Find the best deals on Missoula lodging here (we like the Holiday Inn downtown because it’s close to everything, affordable, and nice/clean). Other Things to Do Near Nimrod Warm Springs: Play in Missoula, play some more, fishing, downhill skiing at Snowbowl, hiking, mountain biking, rafting, kayaking. Depending on how you look at the map, K Bar L Ranch hot springs are the only hot springs near Glacier National Park. However, if you leave via the west entrance and Kalispell, the hot springs in the town of Hot Springs aren’t too far either. 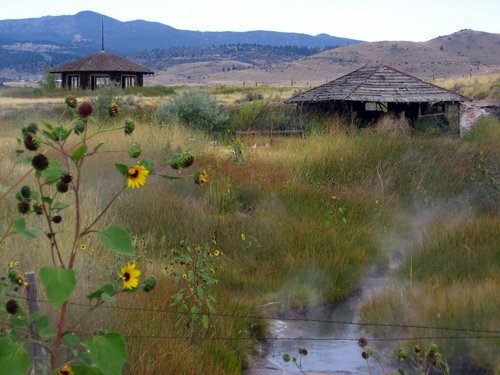 Like most hot springs in Montana, the medicine springs at the K Bar L Ranch were first used by native cultures before explorers, mountain men, and ranchers took them over. Everyone wants to soak in the healing waters springing from the earth. To jump in this hot spring pool, you’ll have to be a guest of the K Bar L Ranch, as it is now part of their property. Henry and his family visited the K Bar L when he was a kid and he occasionally reminisces about what an amazing place it is. Hopefully, the boys and I will get to visit one day. Book your stay at the K Bar L Ranch online. No roads to K Bar L, you have to ride a horse in or walk. In summer a boat works, too. K Bar L Ranch Prices (1/18) Included with lodging. Other Things to Do at K Bar L Ranch and Medicine Springs: horseback riding, hunting, fishing, hiking swimming, caving. There aren’t any hot springs very near Billings, but the water is pretty warm at The Reef Indoor Water Park inside the Bighorn Resort in Billings. And if you drive a bit north, you’ll find Sleeping Buffalo Hot Springs and Resort as well as undeveloped Montana hot spring, Angela Well. We’ll keep looking for hot springs near Billings, Montana, because I think there may be some undeveloped hot springs not too far away. We haven’t been to this Montana hot spring resort, yet, but we hear that it has been recently remodeled and is really nice. It’s on our list! There is a hot swimming pool, a hot tub, a cold dip pool, and a dry sauna. The water comes from an artesian well 3,200-feet deep. The temperature is 108 degrees F. They say the water contains many beneficial and essential minerals. Lodging includes tent and RV sites and luxury cabin rentals. Book your Sleeping Buffalo Hot Springs lodging on their site. 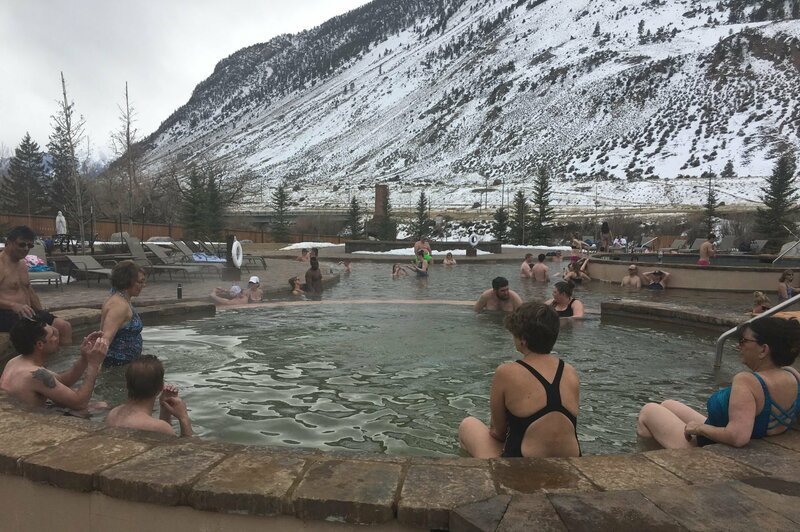 Sleeping Buffalo Hot Springs Hours: (Fall and Winter) Wednesday/Thursday/Sunday 10 am-8 pm, Friday/Saturday 10 am-9 pm, (Spring and Summer) Seven days a week 10 am-9 pm. Other Things to Do Near Sleeping Buffalo Hot Springs: Ice fishing, fishing, Great Plains Dinosaur Museum in Malta. Far from everything, Angela Well hot spring is one of the hottest and most isolated undeveloped hot springs in Montana. It is one of the more interesting undeveloped hot springs Montana has to offer. Although far from Yellowstone, Angela Well looks like a mini-Mammoth Hot Springs thanks to its white, mineral terraces. The hot springs sit on private property, but there are no restrictions on access. But, they are a little shallow for bathing so use one of the abandoned bathtubs or just dip your toes. The springs were discovered in the 1950s when an oil company hit hot water rather than oil when drilling an exploratory well, according to the book “Touring Hot Springs: Montana and Wyoming.” Now more than 1,000 gallons of water pour out of a pipe every minute. These geothermal hot springs are worth a look, even if you don’t soak. Find the best deals on Miles City Lodging. From Miles City drive about 28.5 miles north on Hwy 59 (or 57 miles south of Jordan). Turn west on Road 203 for 6.2 miles. Turn left on an unnamed road and drive 2.5 miles. Veer right and drive 0.08 miles to the spring. Angela Well Hot Springs Hours: 24/7, but I wouldn’t want to have to find it in the dark. Other Things to Do Near Angela Well Hot Springs: Tongue River Winery, Range Riders Museum, Pirogue Island State Park. Hunter Hot Springs Montana is located between Livingston and Big Timber. The Crow Indians camped and soaked at the hot springs and there are stories of as many as 1,000 teepees pitched around the hot springs. It was developed by Dr. A.J. Hunter, a miner who camped there on his way to Virginia City. Hunter laid claim to the springs and built a pool in 1869. Today the springs are capped. We live not far from Hunters Hot Springs Montana and I’d love to get over there to see if there is anything left. From what I understand (thanks to our local Facebook group) is that there are a lot of “No Trespassing” signs and even hidden cameras. The landowner wants to keep everyone off his property. When he first purchased the land, he planned to donate old fire hydrants and other parts of the hot spring property to the Park County Historical Society, but they were stolen or vandalized before he could do that. Let me know if you have been there recently and have any photos. There are three hot springs near Helena Mt – Broadwater Hot Springs, Boulder Hot Springs, and White Sulphur Springs (which is the same distance from Bozeman as Helena). These Helena MT hot springs are part of a fitness center and restaurant complex. There is a 30×70-foot free-form saltwater pool, 25x 70-foot recreation pool, 24x 60-foot soaking pool, a hot tub, and a cold plunge. All the pools are outside and filled with natural hot spring water and cooled with water from the Broadwater River. Find the best deals on lodging in Helena, Montana. Other Things to Do Near Broadwater Hot Springs: Hike and bike in Helena, ride the carousel and visit Exploration Works!, explore Last Chance Gulch, take a boat through the Gates of the Mountains. Boulder Hot Springs resort was built in the late 1800s to release tension in the muscles of gold miners. Today it is a bed and breakfast and conference center complete with an outdoor hot springs-fed pool, men’s and women’s indoor plunges, steam rooms, and spa services. The Boulder MT hot springs outdoor pool is the perfect temperature for swimming. They are all about healthy living at Boulder Hot Springs MT, so leave the booze at home. Book your Boulder Hot Springs lodging on their site or find the best deals on lodging in lodging in Helena or Butte. Boulder Hot Springs Hours: (Summer) 10 am-9 pm, (Winter) 12 pm-8 pm. Other Things to Do Near Boulder Hot Springs: Radon Health Mine, Tizer Botanical Gardens, Elkhorn State Park (ghost town), hiking. White Sulphur Springs is one of the quirkier Montana Hot Springs spas, but really, most of them are a little quirky. That’s why we love them. The sulfur hot springs flow into two pools, one a little hotter than the other. Here are some photos from one of our visits. In addition to the two outdoor pools, there is a very hot indoor pool and a natural health clinic on the premises. The Spa Motel has 33 rooms, the ones in the “new section” are poolside and substantially nicer. Book your Spa Motel lodging on their site. White Sulphur Springs Spa Hours: 365 days a year 6 am–11 pm. Other Things to Do Near White Sulphur Springs Spa: hiking, biking, fishing, floating the Smith River, stay in the Kings Hill Cabin, cross-country ski at Silver Crest Ski Area, downhill ski at Showdown. All these natural hot springs Montana has dotting the state should keep you busy for awhile, but which other hot springs in MT would you add to the list? If you want more info on the hot springs around Montana, check out MontanaHotSprings.net. Hey! Why don’t you Pin this so you don’t forget it….and check out my hot springs board while you are there. Hi I was trying to research hunters hotsprings and from what I can find I heard it says no trespassing. Do you know if this is true or of they allow people to go to it now? Thanks so much! Your website was very helpful and I really want to check out Angela hotsprings this weekend! Hi Sarah- Thanks for stopping by! It sounds like there are a lot of “no trespassing” signs and hidden cameras on the property. When the current landowner purchased the property he planned on donating some parts of it to the Park County Historical Society, but people came in and stole things or vandalized things before he could get to it. Now, he just wants everyone to stay away, from what I have heard. You can see a little from the road if you know what you are looking for (and it is marked on Google Maps, but don’t try to get too close. You could always contact the landowner and ask for permission if you are really gung-ho (I have no idea what he would say to that). Good luck and let me know if you find anything out! Hi! Thanks so much for the wonderful article I was just wanting to comment on something I noticed when reading about Wild Horse Hot Springs. It says the location is in Glacier County but I believe the correct County would be Lake Country. Unless they have changed the county lines in recent. I grew up in Hot Springs which is in Sanders County and as far as I know it either butts up to Lake County or Flathead County on that side. ?